I am a devoted admirer of Ranbir Kapoor all of whose movies I have covered, until now. So it's obvious when his recent flick 'Barfi' is coming to stage, I won't like to miss it. Now Perrysburg is not New York that you get everything handy in close vicinity. So after a lot of researching, finally we have located down a hall, 100 miles driving distance away in Detroit where the movie is being screened. This is going to be my first movie venture in US. I am a movie buff and in India, me with my hubby used to watch almost every of the new releases, especially in Bangalore where the entertainment options were limited within the malls, catching movie every weekend was a regular affair. Over here, mostly we watch movies on Netflix or buy the latest Hollywood flicks online on Buckeye cable connection. Since we are fonder of watching English movies than Hindi, we have never missed much. However, 'Barfi' is another story. I won't like making an effort of travelling to a faraway hall just to blow money on some stupid movies like 'Rowdy Rathore' or Salmon starrer 'Ek Tha Tiger' that can be watched anytime online when it hits the cyber world. But for 'Barfi' especially when the first day first show watchers are singing praise of Ranbir's exemplary performance and of the movie being first of its kind in Bollywood as regards artistic way of telling the story, I can't miss it for the world. 1) Combine the cream and sugar in a saucepan and heat gently on medium heat, stirring continuously until the sugar has dissolved, then bring to a boil. Simmer for 2-3 minutes more, reducing the heat. 2) Remove the saucepan from the heat and stir in the sour cream. 3) Sprinkle the gelatin over the water in a ladle and let it get absorbed. Then hold the ladle over a saucepan of boiling water and stir until the gelatin is dissolved. 4) Stir the gelatin into the cream mixture. 5) Divide the mixture, now, into two equal portions. 6) Melt the semisweet chocolate in a broiler or in a microwave. 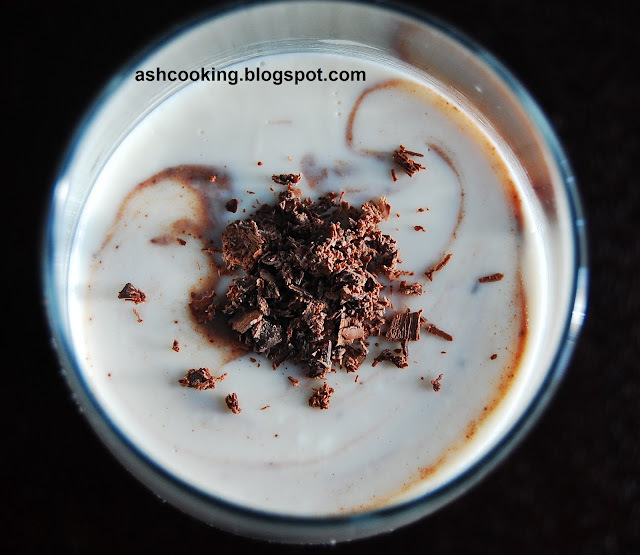 Stir the melted chocolate into half of the cream mixture. Pour the chocolate mixture into four individual serving glasses and keep in freezer for 15-20 minutes until just set. 7) White the chocolate mixture is chilling, keep the other half of the cream mixture at room temperature. 8) Spoon the cream mixture on top of the chocolate mixture, now set and let chill in the freezer until set. 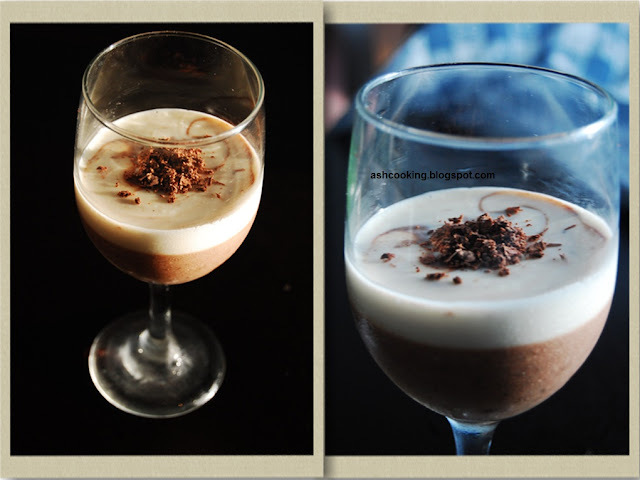 9) Decorate with grated chocolates before serving.